Two crew transferred to and returned in Soyuz 4. Remaining astronaut barely survived nose-first reentry of Soyuz 5, still attached to its service module. AKA: Baikal (Baikal - lake in Siberia);Soyuz 5 (Volynov). Launched: 1969-01-15. Returned: 1969-01-18. Number crew: 1 . Duration: 3.04 days. Commander Volynov shuttled the EVA crew of Yeliseyev and Khrunov into earth orbit. A day later Soyuz 4 docked with Soyuz 5. Khrunov and Yeliseyev transferred to and returned in Soyuz 4, the feat they had hoped to accomplish in the cancelled Soyuz 2 flight almost two years earlier. Officially the flight conducted scientific, technical and medico-biological research, checking and testing of onboard systems and design elements of space craft, docking of piloted space craft and construction of an experimental space station, transfer of cosmonauts from one craft to another in orbit. Volynov remained behind to live through the most unbelievable re-entry in the history of spaceflight. The service module of the Soyuz failed to separate after retrofire. Once the Soyuz started reaching the tendrils of the atmosphere, the combined spacecraft sought the most aerodynamically stable position - nose forward, with the heavy descent module with its light metal entry hatch at the front, the less dense service module with its flared base to the back. Luckily the struts between the descent and service modules broke off or burned through before the hatch melted through and the descent module righted itself, with the heat shield to the rear, before being consumed. Due to a failure of the soft-landing rockets the landing was harder than usual and Volynov broke his teeth. Recovered January 18, 1969 07:58 GMT. Soyuz 4 successfully lifted off from Launch Complex 31 the next day. 24 hours later it was followed by Soyuz 5 from Launch Complex 1. After the problems with Soyuz 3, a first-revolution docking was not planned. Instead the automatic rendezvous began on 16 January at 13:37 GMT on the 34th revolution of Soyuz 4 and the 18th revolution of Soyuz 5. At 100 m distance Shatalov took over manual control of Soyuz 4 and guided the spacecraft to an accurate docking on the first attempt at 14:20 GMT. The Soyuz 4 active spacecraft was equipped with a long docking probe, designated 'Shtir'. 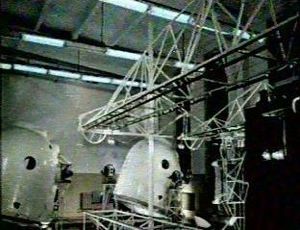 The Soyuz 5 target spacecraft was equipped with the 'Konus' receptacle. The symbology lead Volynov to joke that he 'was being raped' when the hard docking was accomplished. Following docking Khrunov and Yeliseyev aboard Soyuz 5 immediately began preparing for their EVA. Volynov filmed them donning their Yastreb space suits. On the 35th revolution of the earth Khrunov and Yeliseyev, left Soyuz 5 and in one hour spacewalked to Soyuz 4. Soyuz 4 and 5 separated after 4 hours and 35 minutes docked together. Volynov remained behind for what was undoubtedly the most unbelievable re-entry ever survived. The PAO service module of the Soyuz failed to separate after retrofire. While this had occurred on various Vostok and Voskhod flights, and on one Mercury flight, it was a much more serious problem for Volynov, where the module was much larger than a small retropack. Furthermore, once it started reaching the tendrils of the atmosphere, the combined spacecraft sought the most aerodynamically stable position - nose forward, with the heavy descent module with its light metal entry hatch at the front, the less dense service module with its flared base to the back. Volynov at once appraised the situation and considered all possibilities and realized that there was nothing he could really do. The spacecraft was re-entering air-lock forward and with every minute the G forces increased. Volynov did his duty with all of his strength but this became increasingly difficult since he was hanging in the straps of his seat with the G forces assailing him in the opposite direction from what planned. Soon a strong smell penetrated the cabin - the rubber gaskets of the hermetic seal of the hatch were burning. The hatch had a light covering of heat protective resins, but at the last moment these could not hold out and the vaporized into fumes that immediately spread throughout the cabin. Volynov could remain conscious for only a few seconds after this. He remained alive when a miracle occurred - a miracle for which he could thank the designers who had included a strong titanium frame which helped the airlock hold out against the onslaught of the superheated plasma. The PAO service module finally separated from the SA re-entry vehicle. The capsule turned around to an aerodynamically stable position at hypersonic speed and the heat shield finally took the brunt of the heating as designed. The spacecraft continued on a 9 G ballistic trajectory. The damage to the capsule resulted in a failure of the soft-landing rockets. The landing was harder than usual and Volynov broke his teeth. The capsule was recovered 2 km SW of Kustani, far short of its aim point, on January 18, 1969 at 07:58 GMT. It would be seven years until Volynov flew again, on Soyuz 21. The crew was to be feted at a state ceremony at the Kremlin, but this was ruined by an attempted assassination of Soviet leader Brezhnev. A man from Leningrad armed with two pistols shot eight times at the second car of the motorcade, in which was not Brezhnev but rather cosmonauts Beregovoi, Leonov, Nikolayev, and Tereshkova. They were not injured but Brezhnev's vehicle accelerated and sped past the waiting Soyuz 4/5 crews on the podium on Red Square and into the safety of the Kremlin. Family: Manned spaceflight. People: Volynov. Country: Russia. Spacecraft: Soyuz 7K-OK. Launch Sites: Baikonur. Agency: MOM. 1968 September 28 - . Cosmonaut exams are held for Beregovoi, Shatalov, and Volynov. - . Nation: Russia. Related Persons: Beregovoi, Bykovsky, Klimuk, Kuklin, Leonov, Makarov, Popovich, Rukavishnikov, Sevastyanov, Shatalov, Voloshin, Volynov. Program: Soyuz, Lunar L1. Flight: Soyuz 3, Soyuz 4, Soyuz 5, Soyuz 7K-L1 mission 1, Soyuz 7K-L1 mission 2, Soyuz 7K-L1 mission 3. Spacecraft: Soyuz 7K-L1, Soyuz 7K-OK. The results will establish the order in which they will fly as Soyuz commanders. A 25-person board, consisting of spacecraft designers and cosmonauts, conduct the oral examinations. Each cosmonaut must answer five mandatory essay questions and select two two-part questions. All three are certified for flight and have a complete mastery of the Soyuz systems. Mishin and Kamanin meet and decide on L1 crews: Leonov-Makarov (with Kuklin as back-up); Bykovsky-Rukavishnikov (Klimuk back-up); and Popovich-Sevastyanov (Voloshin back-up). But that evening Leonov has yet another automobile accident. He hit a bus with his Volga at kilometre 24 near Shchelkovsky. This was his second accident in four months. Kamanin decides to prohibit him from driving automobiles for six months. 1968 October 1 - . L1 and Soyuz plans - . Nation: Russia. Related Persons: Belyayev, Beregovoi, Leonov, Nikolayev. Program: Soyuz, Lunar L1. Flight: Soyuz 3, Soyuz 4, Soyuz 4/5, Soyuz 5, Soyuz 7K-L1 mission 1. Spacecraft: Soyuz 7K-L1, Soyuz 7K-OK. The L1 cosmonauts are doing training in autonomous navigation, zero-G training, and TBK-60 simulator training. Due to the continuing L1 failures, there would probably be no manned L1 flight until April-May 1969. As for Soyuz, a 0+1 (docking of one unmanned spacecraft and a manned spacecraft with a single cosmonaut aboard) is planned for 25 October, to be followed by a 1+3 mission with a crew transfer by December at the earliest - possibly not until February-March of the following year. Kamanin reassured Beregovoi that he will indeed fly following his excellent exam results -- but Beregovoi still has doubts. Later Kamanin confronts Leonov over his driving. Leonov has had three auto accidents in four months - simply too much. If he is such a bad driver on earth, how will be in space? Kamanin tells him to take two to three days off work and seriously consider his attitude and position. Next there are commissions to attend in charge of selecting monument designs for Gagarin memorials. There are to be obelisks at the Gagarin crash site, at the Vostok 1 landing site, and in Star City. These commissions are taking up a lot of the cosmonauts' time. Kuznetsov meets with Kamanin and tells him that cosmonauts Belyayev and Nikolayev rated Beregovoi poorly in the exam, giving him only a 5 and citing errors in his logic. 1968 November 10 - . Soyuz, L1 training - . Nation: Russia. Program: Lunar L1, Soyuz. Flight: Soyuz 4, Soyuz 4/5, Soyuz 5, Soyuz 7K-L1 mission 1. Spacecraft Bus: Soyuz. Spacecraft: Soyuz 7K-L1. The Soyuz cosmonaut group is in zero-G training at Zhemchug. The L1 group is learning celestial navigation at the State Optics Institute (GOI)..
1968 November 20 - . Soviet manned circumlunar flight set for February - . Nation: Russia. Related Persons: Leonov, Titov. Program: Soyuz, Lunar L1. Flight: Soyuz 4, Soyuz 4/5, Soyuz 5, Soyuz 7K-L1 mission 1. Spacecraft: Soyuz 7K-L1, Soyuz 7K-OK.
Titov still would prefer to be a test pilot, not a cosmonaut. The Soyuz group is scheduled to complete their training and to depart for the cosmodrome on 20 December for final preparations. Leonov's L1 group is to complete their training on 20 January 1969, then depart to the cosmodrome for a flight to the moon in February. Soyuz spacesuit review - . Nation: Russia. Related Persons: Beregovoi, Mishin. Program: Lunar L1, Soyuz. Flight: Soyuz 3, Soyuz 4, Soyuz 4/5, Soyuz 5. Spacecraft: Soyuz 7K-L1, Yastreb. Kamanin attends an Yastreb spacesuit review with VVS doctors. The suit removes 200 cal/hour, but when the cosmonaut is exerting himself, he will generate 3 to 4 times more than this. So the cabin is chilled to 18 deg C prior to the EVA, and there will be lots of pauses during preparations to exit the spacecraft. The L1 cosmonaut-engineers at the meeting have little zero-G experience, and need to get a lot more. The new oxygen generating system for the L1 is still not complete. It will be 6 to 8 kg lighter than the old system (using calcium instead of the old material). Mishin insists that the new system should be completed and installed. Ground qualification testing will be completed on 1 January, but the system will not be flight-proven - Kamanin believes it needs test on low earth orbit missions before being adopted for lunar flights. Beregovoi's experience on Soyuz 3 is reviewed. He needed more time to adapt to zero-G before being required to attempt a docking. He had the impression he was upside-down and had intestinal tract problems. 1968 November 23 - . Soyuz 4/5 crew training - . Nation: Russia. Program: Soyuz. Flight: Soyuz 4, Soyuz 4/5, Soyuz 5. Spacecraft: Yastreb. The Soyuz crews complete training in the TBK-60 vacuum chamber and zero-G flights aboard the Tu-104. These show there exertion level in the Yastreb suit to be 600 to 900 kcal/hr - and the suit is rated to only 1/3 to 1/4 of that amount..
1968 November 28 - . Soyuz 4 / 5 spacecraft begin preparation - . Nation: Russia. Program: Soyuz. Flight: Soyuz 4, Soyuz 4/5, Soyuz 5. Spacecraft Bus: Soyuz. Spacecraft: Soyuz 7K-OK.
Soyuz spacecraft 12 and 13 have begun their 45 day preparation cycle at Baikonur, which implies a 15 January 1969 launch for he Soyuz 4/5 mission. The crews will be ready by 25 December. 1968 December 20 - . Volynov crew selection questioned - . Nation: Russia. Related Persons: Volynov. Program: Soyuz. Flight: Soyuz 4, Soyuz 4/5, Soyuz 5. The Communist Party Central Committee meets to approve the crews for the upcoming Soyuz 4/5 flights. The committee is unhappy with the selection of Volynov - his mother is a Jew..
1968 December 25 - . Launch dates set for Soyuz 4 and 5 - . Nation: Russia. Related Persons: Beregovoi. Program: Soyuz. Flight: Soyuz 4, Soyuz 4/5, Soyuz 5. Apollo 8 is on its way back to earth, but re-entry into the earth's atmosphere from lunar distances is risky, as the Soviet experience with the L1 has shown. The State Commission meets at 16:00 and sets the launch dates for Soyuz 4 and 5. Meanwhile Beregovoi and Yurasov are in the Soyuz spacecraft in the assembly building, running communications checks. 1969 January 4 - . Soyuz 4/5 preparations - . Nation: Russia. Program: Soyuz. Flight: Soyuz 4, Soyuz 4/5, Soyuz 5. Kamanin and 50 VVS officers arrived at Tyuratam aboard an An-24 to supervise the launch of Soyuz 4 and 5..
1969 January 6 - . Mishin a no-show. - . Nation: Russia. Program: Soyuz, Lunar L3, Lunar L1. Flight: Soyuz 4, Soyuz 4/5, Soyuz 5. There is much criticism of Mishin and Keldysh for not attending launches any longer. The opinion is that they are afraid to show their faces..
1969 January 7 - . Preparations at Baikonur - . Nation: Russia. Program: Soyuz, Luna. Flight: Soyuz 4, Soyuz 4/5, Soyuz 5. Spacecraft Bus: Soyuz. Spacecraft: Soyuz 7K-OK. The head of the launch commission for Venera-5 and 6 says that will work on the Ye-8 and Ye-8-5 robot moon landers was making progress, it would be fantasy to believe that a moon landing and return to earth could be successfully accomplished in 1969. Venera was 'no answer' to Apollo at all. Meanwhile, he was worried about Soyuz landing in the Aral Sea in the event of problems during re-entry. Kustanin remembers times in the past when supposedly 'waterproof' spacecraft had landed in water. One Soyuz had splashed down in the Aral Sea, and one Zenit spysat in the Volga River. Both sank easily. But the chances of either Soyuz 4 or 5 landing in the Aral Sea were assessed as only 0.003. In any cases 5 helicopters and 3 Be-12 seaplanes were on standby to recover the crew in such an eventuality. 1969 January 8 - . Concern over the possibility of Soyuz 4 or 5 landing in the Aral Sea continues. - . Nation: Russia. Program: Soyuz. Flight: Soyuz 4, Soyuz 4/5, Soyuz 5. Spacecraft Bus: Soyuz. Spacecraft: Soyuz 7K-OK.
An Il-14 is sent on a flight to reconnoitre. It reports 12 to 50 cm ice over the entire surface. Mishin, Chertok, and the rest of he OKB-1 entourage arrive. An argument immediately ensures over provisions and planning for emergency landings. It is decided to make a review of emergency landing and recovery plans as the first agenda item every day of he flights. 1969 January 12 - . Soyuz 4/5 profile still not settled - . Nation: Russia. Related Persons: Afanasyev, Sergei, Mishin, Ustinov. Program: Soyuz. Flight: Soyuz 4, Soyuz 4/5, Soyuz 5. Spacecraft Bus: Soyuz. Spacecraft: Soyuz 7K-OK.
At Baikonur, Ustinov and Afanasyev get into an argument with Mishin. They want Soyuz 4 and 5 to accomplish a completely automatic docking, as was done successfully by Cosmos 186/188 and Cosmos 212/213. Mishin categorically rejects this. He wants a manual docking, which was unsuccessful when attempted by Beregovoi on Soyuz 2/3. Meanwhile the Soyuz 4/5 crews hold a news conference. 1969 January 13 - . Soyuz 4 scrub - . Nation: Russia. Program: Soyuz. Flight: Soyuz 4, Soyuz 4/5, Soyuz 5. Spacecraft Bus: Soyuz. Spacecraft: Soyuz 7K-OK. The launch of the 13th Soviet cosmonaut into space aboard Soyuz 4 is scrubbed - the first launch scrub in the history of Soviet manned launch attempts. Despite -24 deg C temperatures and 8 to 10 m/s winds, the fuelling of the rocket proceeds successfully. Voice communications are lost with Shatalov whenever the television camera is turned on, but it is decided just to leave the camera off and proceed with the launch. Then at T - 9 minutes a problem is detected with the gyro platform of the rocket. It takes three hours to fix, pushing the launch back to 15:00, meaning the landing will have to be in darkness at the end of the mission. It is decided this is too risky, and the launch is cancelled. As Shatalov exits from the spacecraft, he jokes that he has set a new record: shortest space flight, and first to return to its exact point of lift-off. The engineers are concerned with the internal temperature of the SAS abort system solid rockets if left on the pad for 24 hours in these temperatures. The internal temperature of the fuel cannot go below -2 deg C at night. Any lower, the loss of specific impulse of the fuel would reduce the thrust by more than 5%, the limit established for safe operation. Soyuz 4/5 profile still not settled - . Nation: Russia. Program: Soyuz. Flight: Soyuz 4, Soyuz 4/5, Soyuz 5. Spacecraft Bus: Soyuz. Spacecraft: Soyuz 7K-OK. In the evening Afanasyev hosts 100 guests - the leadership of the space program - to watch the big Army-Dinamo football game. Space plans are discussed. The State Commission still needs to confirm the crews for Soyuz 4/5. The issue of automatic versus manual rendezvous is again argued. Kamanin believes this reliance on automated systems has cost the Soviet Union the moon race. 1969 January 15 - . 07:04 GMT - . Launch Site: Baikonur. Launch Complex: Baikonur LC1. LV Family: R-7. Launch Vehicle: Soyuz 11A511. Soyuz 5 - . Call Sign: Baikal (Baikal - lake in Siberia). Crew: Khrunov, Volynov, Yeliseyev. Backup Crew: Filipchenko, Gorbatko, Kubasov. Payload: Soyuz 7K-OK (P) s/n 13. Mass: 6,585 kg (14,517 lb). Nation: Russia. Agency: MOM. Program: Soyuz. Class: Manned. Type: Manned spacecraft. Flight: Soyuz 4/5, Soyuz 5. Spacecraft Bus: Soyuz. Spacecraft: Soyuz 7K-OK. Duration: 3.04 days. Decay Date: 1969-01-18 . USAF Sat Cat: 3656 . COSPAR: 1969-005A. Apogee: 212 km (131 mi). Perigee: 196 km (121 mi). Inclination: 51.70 deg. Period: 88.60 min. 1969 January 16 - . 12:43 GMT - . 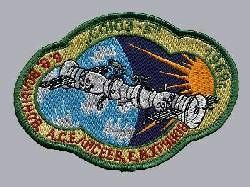 EVA Soyuz 4/5-1 - . Crew: Khrunov, Yeliseyev. EVA Duration: 0.0257 days. Nation: Russia. Related Persons: Khrunov, Yeliseyev. Program: Soyuz. Class: Manned. Type: Manned spacecraft. Flight: Soyuz 4, Soyuz 4/5, Soyuz 5. Spacecraft Bus: Soyuz. Spacecraft: Soyuz 7K-OK.
1969 January 18 - . Volynov's survival celebrated - . Nation: Russia. Related Persons: Babakin, Mishin, Volynov. Program: Soyuz. Flight: Soyuz 4, Soyuz 4/5, Soyuz 5. Landing of Soyuz 5 - . Return Crew: Volynov. Nation: Russia. Related Persons: Belyayev, Brezhnev, Mishin, Volynov. Program: Soyuz. Flight: Soyuz 4/5, Soyuz 5. 1969 January 19 - . State Commission on Soyuz 4/5 - . Nation: Russia. Program: Soyuz. Flight: Soyuz 4, Soyuz 4/5, Soyuz 5. Spacecraft: Soyuz 7K-OK, Yastreb. At 10:00 a State Commission convenes at Area 17. The mistakes made during the Soyuz 4/5 flight are reviewed. The EVA began with a closed valve on Khrunov's suit. The film camera was not activated, resulting in loss of one of the key propaganda points of the exercise. 1969 January 22 - . Launch Vehicle: N1. Soyuz 4/5 celebrations - . Nation: Russia. Related Persons: Mishin. Program: Lunar L3, Soyuz. Flight: Soyuz 4, Soyuz 4/5, Soyuz 5. TsKBEM closed down for the day, due to celebrations at Kaliningrad and at the Kremlin with the four cosmonauts from the Soyuz 4 /5 mission. Meanwhile, work at Tyuratam preparing the N1 for its first flight continued..
1969 January 22 - . American looks likely to win moon race - . Nation: Russia. Related Persons: Gagarin, Khrunov, Korolev, Mishin, Shatalov, Smirnov, Ustinov, Volynov, Yeliseyev. Program: Soyuz. Flight: Apollo 8, Soyuz 4, Soyuz 4/5, Soyuz 5. 1969 January 23 - . Cosmonauts shot at in assassination attempt - . Nation: Russia. Related Persons: Brezhnev, Feoktistov, Khrunov, Nikolayev, Shatalov, Volynov, Yeliseyev. Program: Soyuz. Flight: Soyuz 4, Soyuz 4/5, Soyuz 5. The assassination attempt is made on Brezhnev, instead hitting the cosmonaut's car, on the way to the Kremlin. A muted press conference follows. All the cosmonauts are there, except Feoktistov, who is on honeymoon with his second wife, and Nikolyaev, who has the Hong Kong flu. 1969 January 28 - . Soyuz 4/5 crew feted - . Nation: Russia. Related Persons: Khrunov, Shatalov, Volynov, Yeliseyev. Program: Soyuz. Flight: Soyuz 4, Soyuz 4/5, Soyuz 5. The last few days have been occupied with daily press conferences or meetings with the state leadership by the Soyuz 4/5 crews..
Kamanin meets with Vershinin. - . Nation: Russia. Related Persons: Bykovsky, Leonov, Mishin, Vershinin, Volynov. Program: Lunar L1, Soyuz. Flight: Soyuz 4/5, Soyuz 5. Spacecraft: Soyuz 7K-L1, Soyuz 7K-OK, Spiral OS.